NEXT Hotel Brisbane is centrally located in Brisbane, a 1-minute walk from Queen Street Mall and 12 minutes by foot from Wheel of Brisbane. 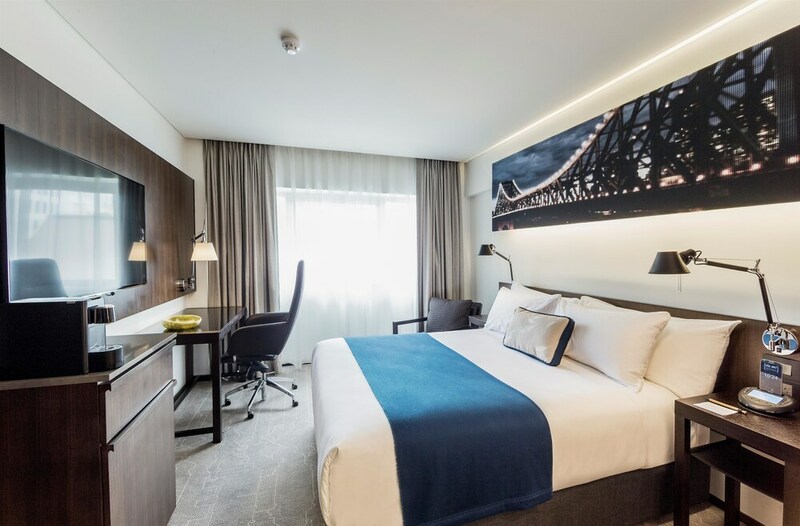 This 4.5-star hotel is 0.8 mi (1.3 km) from Roma Street Parkland and 1 mi (1.6 km) from Brisbane Convention and Exhibition Centre. Make yourself at home in one of the 304 air-conditioned rooms featuring minibars and LED televisions. Complimentary wireless Internet access keeps you connected, and cable programming is available for your entertainment. Private bathrooms with showers feature complimentary toiletries and hair dryers. Conveniences include laptop-compatible safes and desks, as well as phones with free local calls. Be sure to enjoy recreational amenities including an outdoor pool and a 24-hour fitness center. This hotel also features complimentary wireless Internet access and concierge services. For lunch or dinner, stop by Lennons Restaurant, a restaurant that specializes in local cuisine. Dining is also available at the coffee shop/café, and 24-hour room service is provided. Unwind at the end of the day with a drink at the bar/lounge or the poolside bar. Full breakfasts are served on weekdays from 6:30 AM to 10 AM and on weekends from 6:30 AM to 10:30 AM for a fee. NEXT Hotel Brisbane features an outdoor pool and a 24-hour fitness center. Dining options at the hotel include a restaurant and a coffee shop/café. Guests can unwind with a drink at one of the hotel's bars, which include a poolside bar and a bar/lounge. Public areas are equipped with complimentary wireless Internet access. This 4.5-star property offers access to a 24-hour business center and a meeting room. This luxury hotel also offers a terrace, tour/ticket assistance, and multilingual staff. Parking is available onsite for a surcharge. NEXT Hotel Brisbane is a smoke-free property. Full breakfasts are available for a surcharge on weekdays between 6:30 AM and 10 AM and on weekends between 6:30 AM and 10:30 AM. Lennons Restaurant - This restaurant specializes in local cuisine and serves breakfast, lunch, and dinner. Valet parking (limited spaces; surcharge) is accessible via 33 Burnett Lane or self parking at Myer Centre on Elizabeth Street. Height restrictions apply. For more details, please contact the property using the number provided on the booking confirmation email. The hotel advises that free minibar items are limited to 4 items per room, per day. For more details, please contact the property directly using the number provided on the booking confirmation email. Book a stay in any room or rate plan and receive the following: Free 24-hour access to the "In Transit Zone" with showers and sleep pods and free 24-hour access to the Next Lounge.